The first step is to make sure your AdWords and Analytics account are linked. To do this, log in to your Analytics account and select the Admin tab. From here look at the “Property” section, you will find the option under the second heading 'Product Linking'. Once those are linked the two platforms will sync and begin sharing data between one another. As a side note, make sure you have enabled AdWords Autotagging. Autotagging will ensure that each click and action is attributed properly. 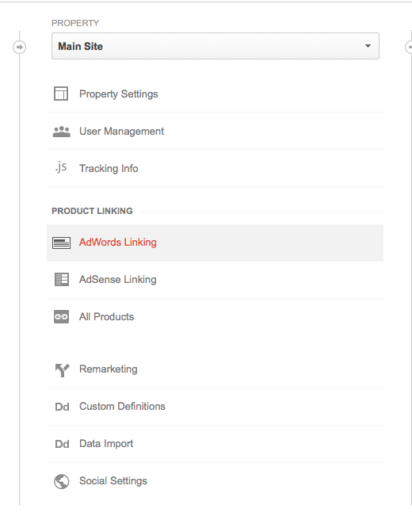 You can now go back to your AdWords account and begin the import process. Simply select 'Conversions' from the Tools menu. You will then see the option to import Analytics goals. Clicking this option will open a new menu with all available goals and options for importing them. That is all you need! Conversions should automatically import into AdWords and populate the conversions column in AdWords. Even if you don’t ultimately use goals as conversions, you should go through these steps anyway. At the very least is will get you in Analytics so you can take a look at features like Analytic’s lists, which are a powerful way to create remarketing lists for use in AdWords. Goals also offer more nuanced options than conversions, such as tracking assets like video clicks. Rather than direct usage a business may have KPIs related to behavior or a specific sequence of actions that indicate a successful visit. This could be something like following a certain process of steps rather than arriving on a discrete page. Counting Conversions Multiple Times – If you import Analytics goals, make sure you aren’t also counting AdWords conversions. If you have done this you will effectively double your actual conversions since AdWords will count it and then Analytics will import the same conversion into AdWords.